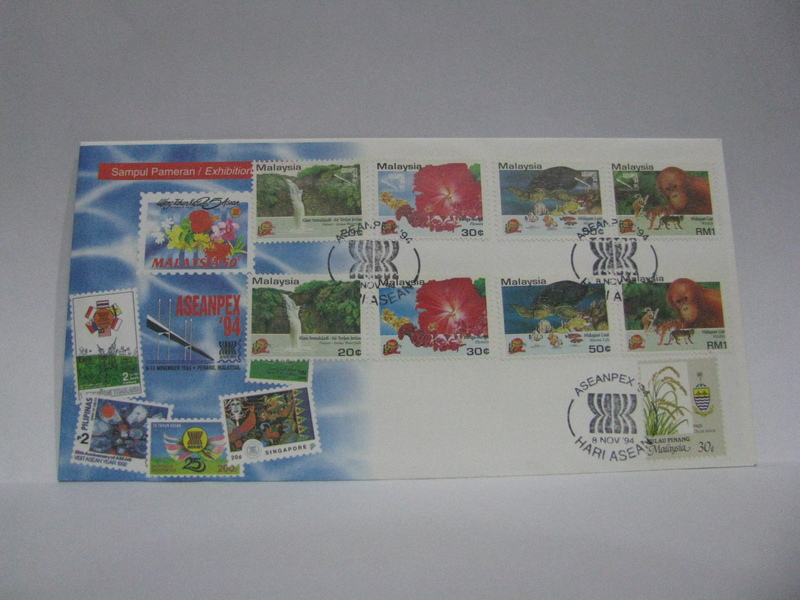 I have only the miniature sheet on FDC cancelled with the Hong Kong ’94 cachet. 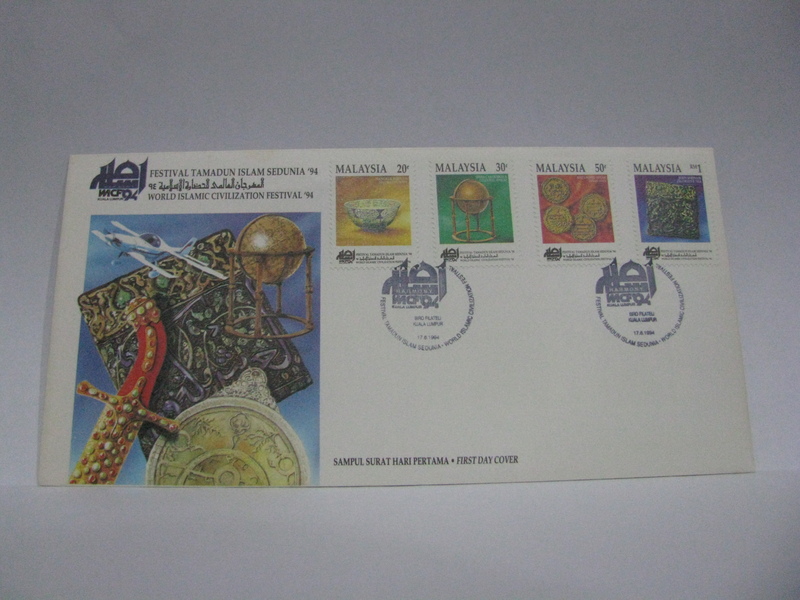 The FDCs was cancelled with the exhibition cachet. 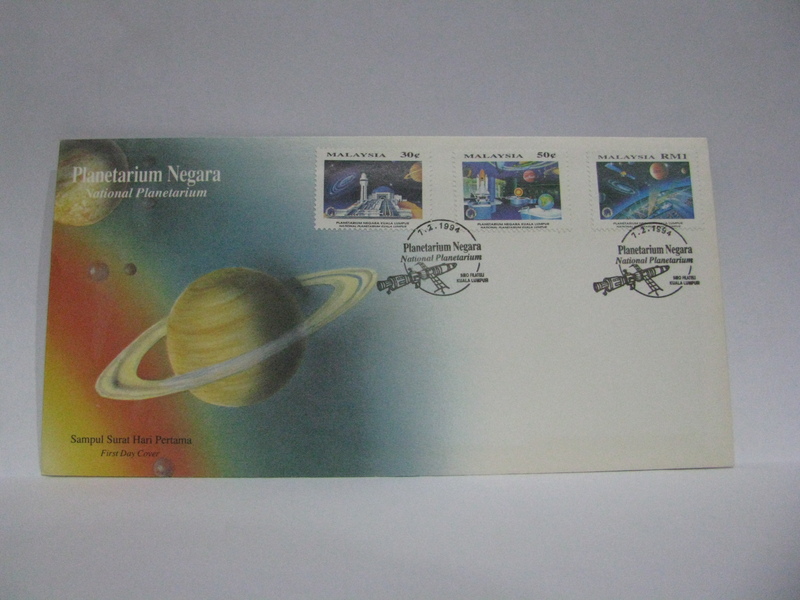 This is a rare cover with the overprinted stamps and the original stamps on the same cover. 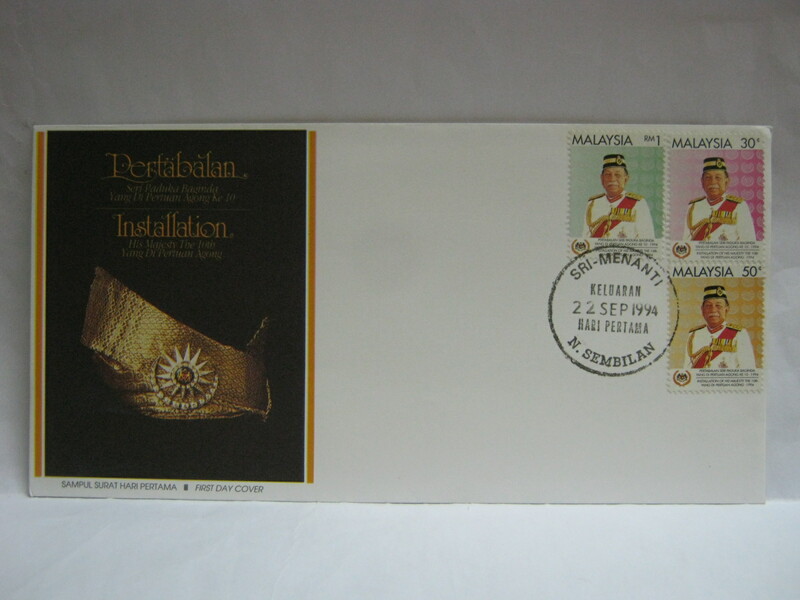 This is a rare FDC cancelled on the first day of exhibition (and also first day of issue for the overprinted stamps). 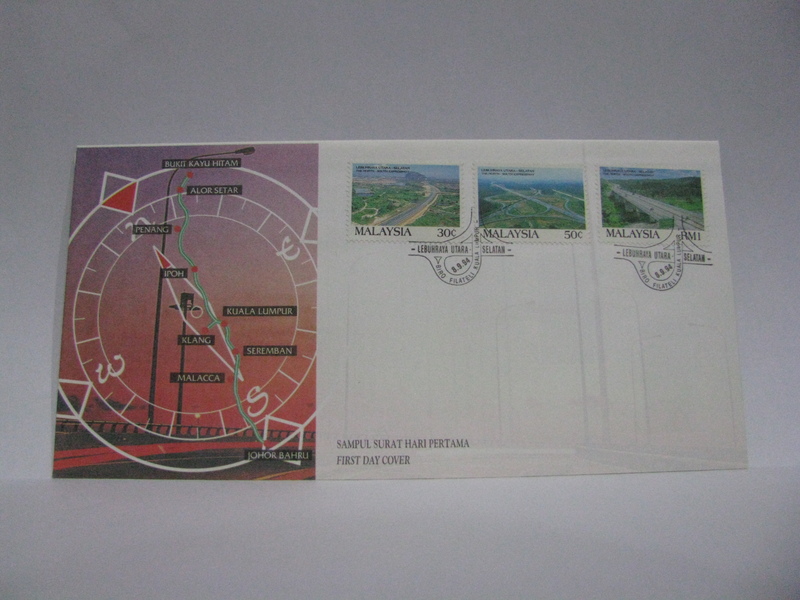 This FDC was cancelled in Alor Setar (one of the Expressway stops shown on the evelope). 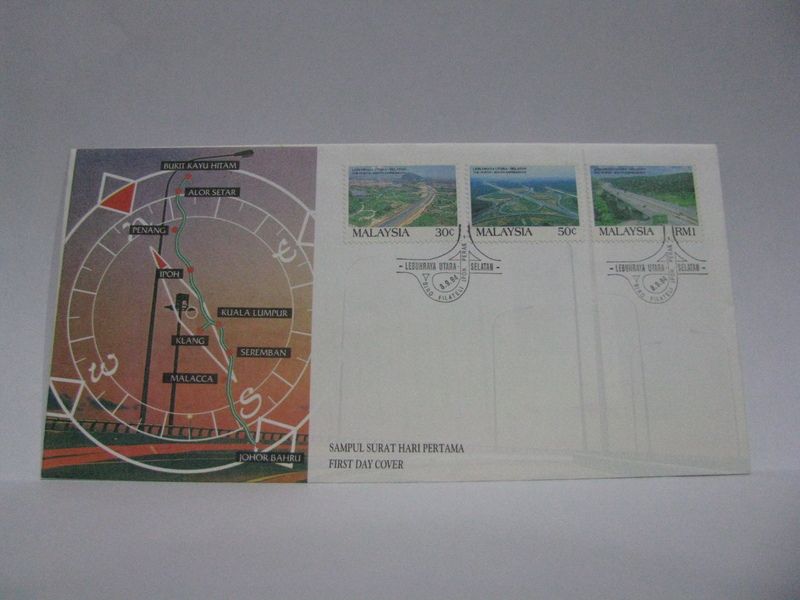 This FDC was cancelled in Pulau Pinang (an exit from the Expressway interchange into Penang Island at Seberang Perai). 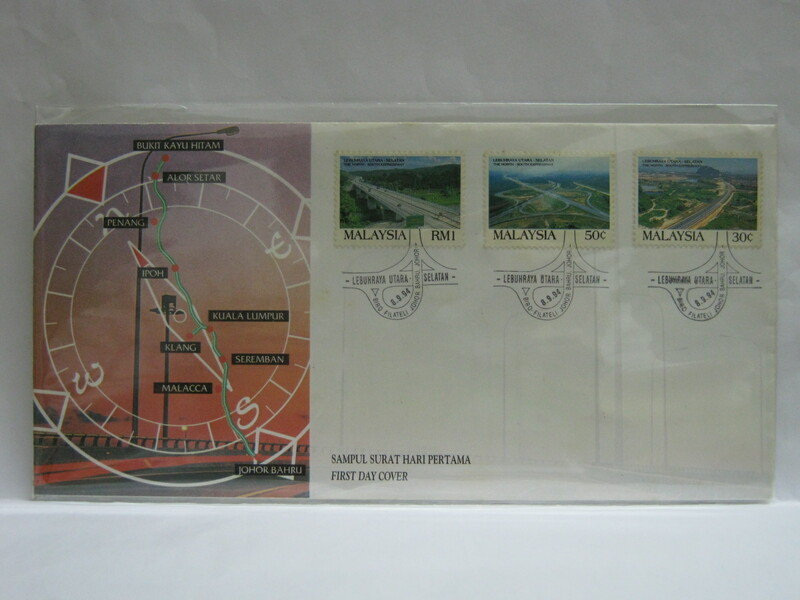 This FDC was cancelled in Ipoh (another one of the stops on the Expressway). 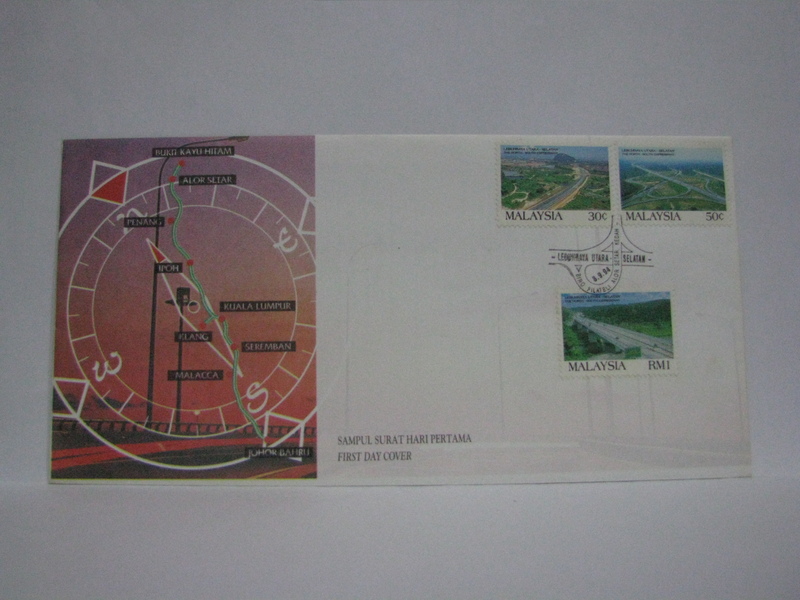 This FDC was cancelled in Kuala Lumpur (the “mid-point” of the Expressway). 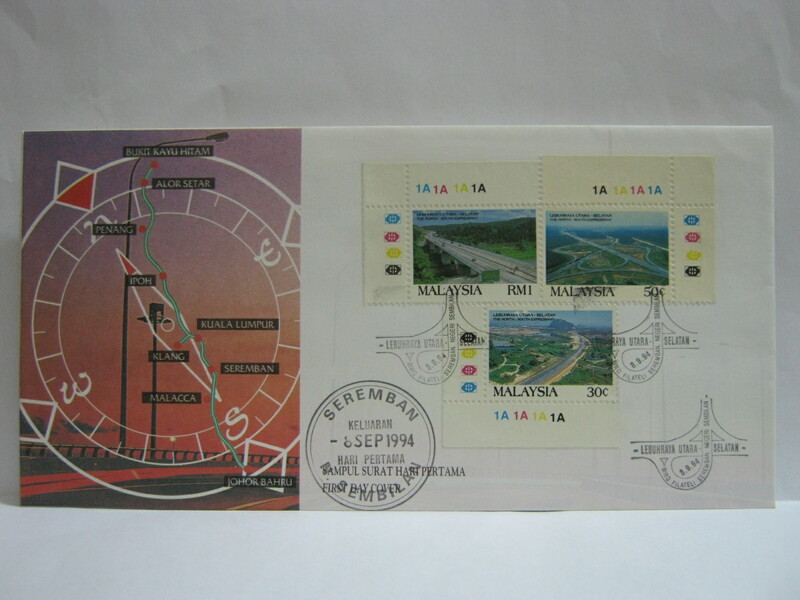 This FDC was cancelled in Melaka (the most convenient interchange into Melaka City is via Ayer Keroh). 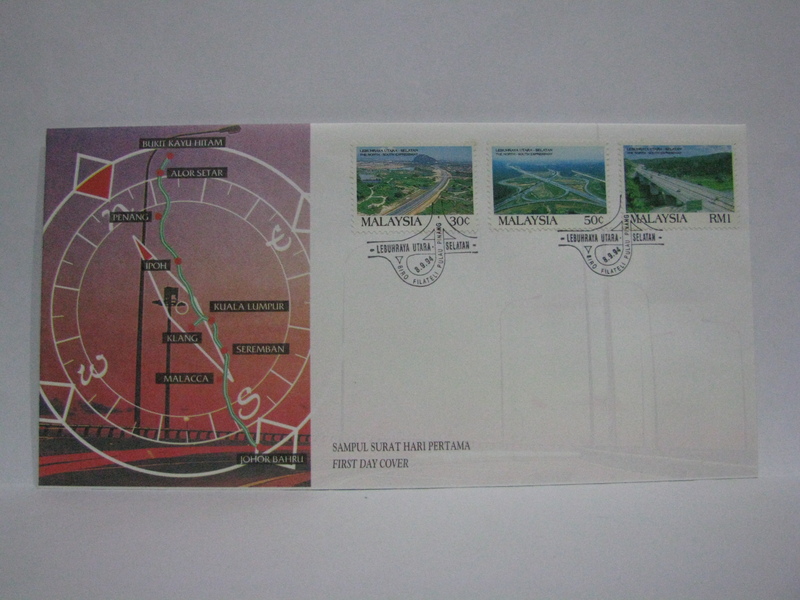 This FDC was cancelled in Johor Bahru (the end of the Expressway). 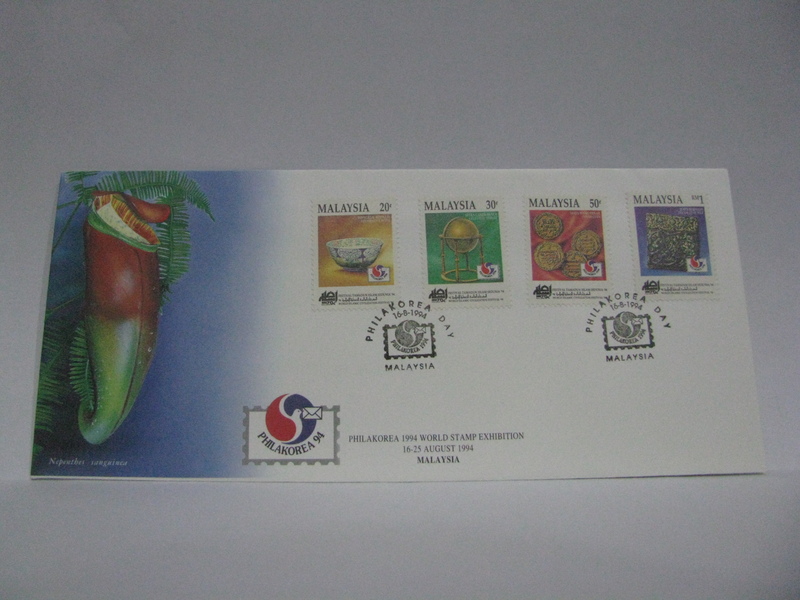 This FDC was cancelled in Sri Menanti the royal town of His Majesty. 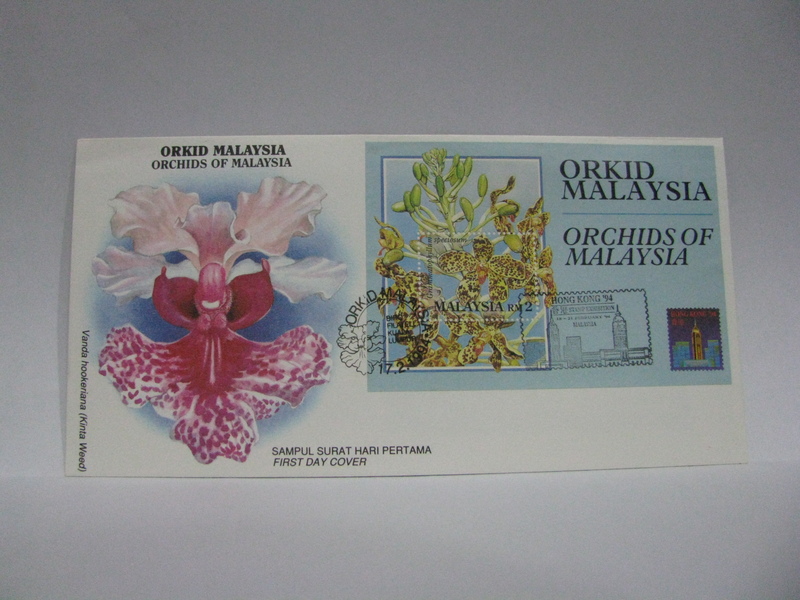 This is a very special and rare cover of both the overprinted stamps and original stamps cancelled on the first day of issue in the ASEANPEX ’94 exhibition. 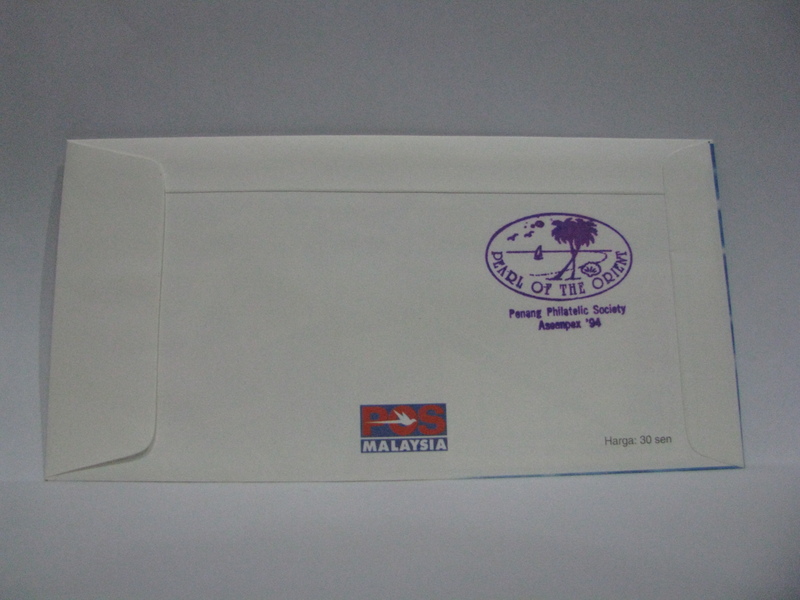 The back of the envelope is cancelled with the special cachet of the Penang Philatelic Society. There was no exhibition cachet. 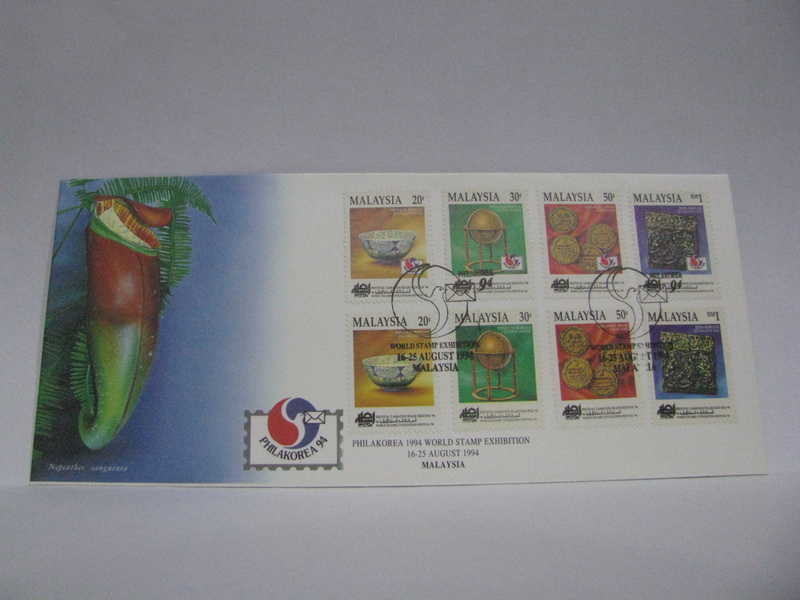 This is the FDC cancelled during the ASEANPEX ’94. The FDC is cancelled with the first day of issue Pulau Pinang cancellation as well as the Hari Pelancongan exhibition day cancellation. 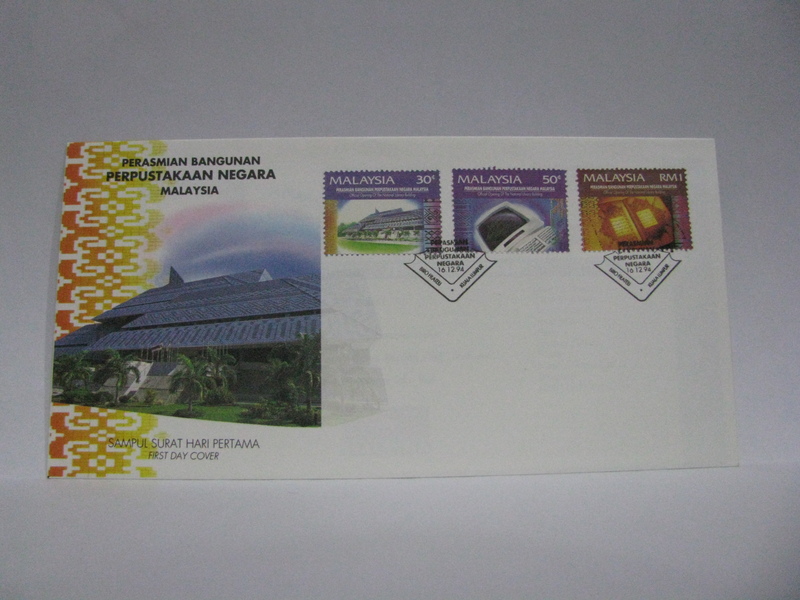 Trivia: Did you know that the Malaysia flag has the wrong design? Look at the red and white stripes. The stripe just below the blue corner should be red! However the design shows a white stripe! 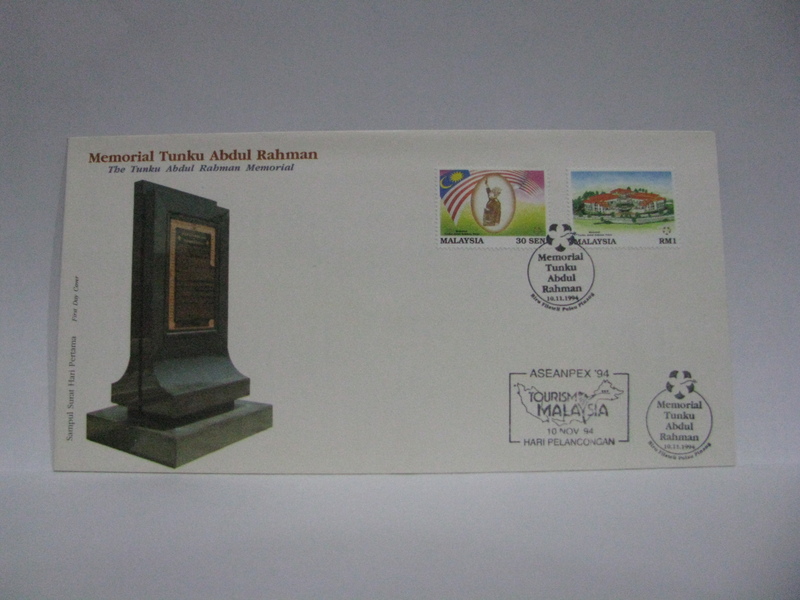 This is the FDC cancelled in Kuala Lumpur. 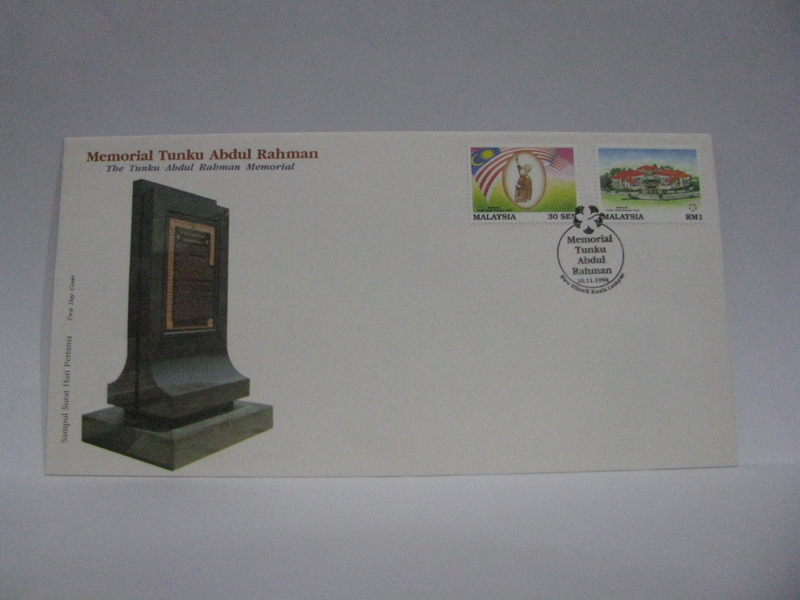 I have not been able to locate any special cancellations from the Tunku Abdul Rahman Memorial.